Now that the year 2000 has come and gone without any of the apocalyptic nonsense we were promised, it is difficult to remember just how far off it seemed back in 1985. To put the technology of the era in context, eight-bit sampling was the order of the day, unless you could afford the tens of thousands of pounds needed to buy a New England Digital Synclavier. So when Sequential Circuits (the company behind the classic Prophet 5 and 10 polysynths) announced that the next Prophet would be called the 2000, and would feature 12-bit sampling, it really seemed that the future had arrived early. In 1983, I had worked for Sequential as a UK demonstrator/rep, but by the mid-'80s, I was working as a freelance Emu EII programmer, as you may recall if you read my two-part Emulator II Retrozone feature in SOS a few years ago (see www.soundonsound.com/sos/sep00/articles/retroemu.htm). However, I couldn't afford my own EII — they cost around 10,000 pounds at the time — so I had to use rental units on sessions when clients didn't have their own. When I got wind of the much more affordable price Sequential were quoting for a Prophet 2000 (around £2000, appropriately enough) I knew I had to hear one, and laid plans to get an early listen to the machine. The first public presentation of the Prophet 2000 was at the Italian Music Fair in Milan, so I cunningly arranged my holiday that year to be on Italy's Lake Como to coincide with this (neglecting to mention to my girlfriend that the planned visit to Milan was on the first day of the show). Having managed to make our arrival there seem like a coincidence, I managed to gain early access, and was on the booth when the show opened. The best I was hoping for at that price point was a sampler that sounded better than the Ensoniq Mirage; I couldn't imagine it equalling the Emulator. Imagine my joy, then, when I discovered that the Prophet actually sounded better than the eight-bit EII. What's more, my old boss from Sequential was there in Milan, and he was looking for someone to do the British launch the following month. I was quickly able to strike a deal whereby I would receive a machine to do the launch in London which I would be able to keep and use afterwards. The day before the launch in London, I was at Livingstone Studios doing some sampling with a newly acquired Ensoniq Mirage for The Waterboys' Karl Wallinger (then their keyboard player, and now of World Party). I seem to remember I was taking brass samples from a multitrack so that Karl could play 'The Whole Of The Moon' live when Roy Goudie (now at Emu, but then recently transferred to Sequential UK from Moog) turned up at the studio with the Prophet. The Waterboys had paid £1800 for their Mirage, so they were a bit cheesed off to discover that for a couple of hundred quid more, it would soon be possible to get a much better-sounding sampler that wasn't quite so difficult to use. However, finishing the session with the Prophet placated them, and when I transferred the samples across to the Mirage via the newly implemented MIDI Sample Dump, the sound quality was more impressive than if they had been sampled from the tape by the Mirage itself. Actually, the operating system of the Prophet 2000 only looked good from an ease-of-use point of view when compared to the Mirage. Typically for a mid-'80s keyboard, it only had a three-character seven-segment LED display for user feedback, but at least the numbers were displayed in the decimal system, instead of in hexadecimal as in the Mirage's two-character LED display! Also, you didn't have to keep a separate laminated list of the user parameters to hand as you did on the Mirage; all the available parameters were shown on the front panel, even if it was a bit tricky at first to use the combination of horizontal and vertical membrane switches surrounding the parameter rows to select the one you wanted to work on. I lost count of the times I saw first-time users trying to select a parameter by pressing the painted tab on the front panel instead of the corresponding row switch at the left and column switch below. It was a system you soon got used to, though, and really allowed an expert programmer to fly through setting up a multisample. Looping was a much more important part of instrument sampling in those days, because all of the contemporary machines had such restricted sample RAM, and on many machines, it was a frustrating and time-consuming process. However, the Prophet 2000 made it particularly easy, thanks to its inclusion of a capability which had previously only been possible with computer-based editing systems like Digidesign's Sound Designer software for the then-new Apple Macintosh. Programmers had started to notice that if you made your loop points at the place where the sample plot crossed the zero amplitude line on the display, you were far less likely to get clicking or an out-of-tune loop. But how could you do this unless you had a computer with the appropriate software? The geniuses at Sequential came up with the idea of having the machine automatically step from zero crossing to zero crossing as you adjusted the loop-point parameters, and this made looping the easiest it had ever been. I was amazed at just how quickly I was able to create good loops on the Prophet. This was particularly handy because the 2000 featured the ability to have both sustain and release loops, another first for a sampler (and one which wasn't repeated in any other sampler family as far as I am aware). Of course, not every sound needs a different loop during the sustain phase to the one in the release phase, but it was terribly useful for experimental sounds where you could have something completely different happen as the note died away. On any other sampler, you might not have had the patience to do a second loop for each sample because of the time involved, but looping was so effortless on the 2000 that I was able to create two different loops in less time than I would normally have spent on one in other machines. That night in London before the launch, I made successful loops of my staple piano, brass and string sounds far more quickly than I had anticipated, and thought that I would be able to get my launch presentation ready for the next day in no time, and turn in early. But the 2000 had a nasty surprise in store for me when I tried to assign the samples across the keyboard, and my timetable went badly off the rails. The sample-assignment process was anything but straightforward. First, you had to select the initial sample that you wanted to assign at the low end of the keyboard, and hit a key with one parameter selected to set where the original pitch would be placed. Then you had to press another key with a different parameter selected to determine the lowest note of that sample's range. The really tricky bit was that you didn't set the highest note of the sample's range — that was determined by the lowest note you set for the next sample up the keyboard. Actually, once you got used to it, the system worked really well, and you could have a multisample set up in no time. But the first time I wrestled with it, it was very confusing and all too easy to end up with high samples lower down and low samples higher up. To make matters worse, the 16 available sample locations were divided into two banks of eight each with only 128K of memory available (yes, just 256K in total — at the time that was all we were used to!) and you couldn't combine samples from different banks in the same multisample — or Maps, as they were called, just to make things even more confusing. You could combine Maps into split/layered or crossfaded/cross-switched sounds, though, and that helped enormously with instruments like grand piano, where you needed to use all 16 samples to achieve a realistic coverage of the entire range of the instrument. In the depths of the night, I really thought the top was going to come off my head. It was taking hours to get each multisampled instrument laid out properly across the keyboard and I had a crowd of press and artists coming to see the instrument at 10 o'clock the next morning. Luckily for me, while poring over the manual for the umpteenth time, I hit upon the single best feature of the 2000, and the one which blew everyone away the next day, saving my bacon in the process. There it was, innocuously enough in black and white — the Prophet 2000 featured the same innovative use of MIDI Mode 4 as the Sequential SixTrak and Casio's CZ-series synths. At the time, all the other MIDI devices on the market would only respond on a single MIDI channel. The SixTrak and the CZ series, in contrast, allowed you to address each voice of the synth on a different MIDI channel — with a different timbre assigned to each voice. This meant that you could use an external MIDI sequencer to sequence different sounds out of the same instrument for the first time. 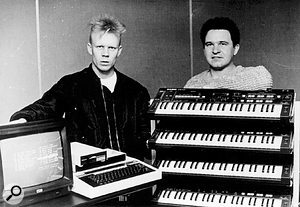 Much of Vince Clarke's groundbreaking use of the BBC Model B-based UMI sequencer on Erasure's early material was done using the Mono Mode on the CZ101s (apparently he had several all racked up to give him reasonable polyphony). However, the Prophet 2000 took things several stages further. Whereas the SixTrak or CZ statically allocated the individual synth voices monophonically to each channel (hence the term Mono Mode), the 2000 allocated them dynamically, and therefore polyphonically, to whichever MIDI channels were requesting note playback. So whereas the SixTrak could only be set to respond to a maximum of six MIDI channels, and the CZ to four, the 2000 automatically looked at all 16, and because the allocation was dynamic, it meant that at one moment the eight voices could be used to play big string chords for a floaty intro, the next there could be eight different sounds playing monophonically on eight different percussion sounds, and then you could have some combination of the two, provided the limit of eight voices wasn't exceeded. And even if it was, the voice-stealing worked in a pretty benign way, taking the oldest note first, which you were least likely to miss. What's more, your palette of timbres could contain any sound you could sample! Vince Clarke (left) of synth popsters Erasure in the mid-'80s with his engineer Eric Radcliffe, his stack of Casio CZ101 Phase Distortion synths, and his BBC Model B-based UMI Sequencer. Each of the CZ101's four multitimbral parts was addressable monophonically on a different MIDI channel of the sequencer, which was highly novel at the time. But Vince still needed several CZs to achieve the polyphony he wanted. Within a few years he was getting around this problem by writing records composed entirely of monophonic lines with no chords at all!In 2004, this may not sound that amazing, but in 1985, it had never been done before. I soon stopped messing about with multisampled piano, strings and brass, and instead loaded the machine with a kick, snare, toms, hi-hat, bass guitar, single muted guitar note, a power chord, lead guitar, strings, brass, electric piano and an orchestra hit — well, it was 1985! — and started sequencing with the Yamaha QX1 I had on loan at the time. The results astounded me. Remember that at the time, almost anyone using a MIDI sequencer needed a separate keyboard for each track they recorded into the sequencer (and it usually was keyboards, too — rack modules were still very uncommon). The home studios of the wealthy I worked with would often have 10 or 12 keyboards racked up, just so you didn't run out of different sounds to assign to MIDI tracks. Getting all these different sounds simultaneously out of a single sampler was amazing (even the super-opulent Fairlight sampler maxed out at eight monophonic sounds). The polyphonic dynamic allocation fooled the ear that you were hearing more than eight notes at once, as you could pick those eight notes polyphonically from a palette of 16 different timbres. When I (finally) went to bed at 5am, I had the best demo sequence I had ever done in my life. The next day at the launch, I started each presentation by playing people a couple of individual piano, strings and brass multisamples so they could hear the quality (I had spent hours making them, after all!). Some of the EII and Fairlight owners who attended were already looking distinctly worried at this point in the demo — but when I loaded the special disk with the 16 different sounds on and started the sequencer, everybody's jaws dropped apart from mine. No-one had ever heard so much music coming out of a single instrument before. Word quickly spread, and within a week, the London music store Argent's had deposits on 30 machines. Not only that, but the Editor of a new magazine coming out later that Autumn saw the innovation in the Prophet 2000, decided it was the perfect competition prize for his inaugural issue, and quickly negotiated it with Sequential. His name was Ian Gilby, and you may have heard of the magazine; you're reading it now. Of course, there were drawbacks with the Prophet 2000's Mode 4 operation. You couldn't use multisamples, so each sound would only work over a range of a few notes before they got too grungy or tinny. The original sampled pitch had to go on middle 'C', so if you had sampled any other note from your source instrument, you had to transpose your sequencer track to be able to play in the right key. But remember that this facility had not been available before — so at the time, these seemed small prices to pay for such flexibility in timbre and voice allocation. Whilst there had been several Emulator II programmers running around London, the Prophet 2000 really gave me a boost over everybody else, and this is perhaps why I remember it so fondly! As I was the first guy to get my hands on it, I was also the first to crack the somewhat obtuse mapping, and so I ended up being the first guy everybody called. All the superstars had Emulator IIs which they were loath to part with (and I still did plenty of sessions with that), but all the up-and-coming bands bought Prophet 2000s and ended up using me. Sequential were also fairly slow to release a library for it, but I soon had hundreds of sounds, so I ended up getting the gigs. Through it I met big bands of the day like Then Jericho (whose 2000 sounds I had to crawl on-stage and change mid-set during their appearance on Channel 4's The Tube) and my personal favourites today, It Bites. It also acted as an introduction to world-music artists like James Asher and soundtrack composers like Mark Isham, for whom I worked out a way of using the Prophet to perform stereo playback, despite its ostensibly mono spec. This was pretty exciting, as at the time only the Synclavier gave you stereo sampling capability — but you had to have 50 grand spare to buy one of those. I achieved stereo playback by taking Mark's ambient DAT recordings and putting a click on both channels just before the sound started. I would then sample each side of the stereo recording to one of the 2000's memory halves using the sample trigger threshold, and then cut the space between the click and the actual sound on each sample by exactly the same amount to ensure the stereo stayed in phase. Some of the things that we got out of the 2000 together by doing this still send shivers up my spine when I hear them. 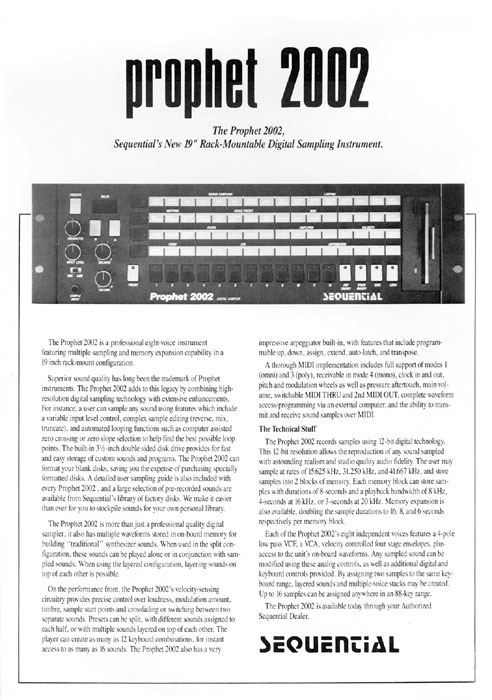 The original 1986 brochure for the rackmount Sequential Prophet 2002. How desktop publishing skills have come on since then! The 2000 may have been groundbreaking when it came out, but the Sequential programmers didn't let the grass grow under their feet. When they released the 2002 rackmount version a few months later, they doubled the memory capacity to 512K (John Bowen demonstrated this at the Frankfurt Musikmesse trade show in 1986 by fitting the entire Mission Impossible theme tune — all 58 seconds of it — into memory at the lowest sample rate, 16kHz (it didn't sound fantastic, as you can imagine, but then we were used to hearing it coming out of low-bandwidth TV speakers). At the time, it amazed people, although such memory capacities would soon be equalled by the arrival of samplers from Akai, Roland and Korg. But to keep existing 2000 owners happy, Sequential introduced another innovation which would become standard in the world of sampling; a memory upgrade. You could buy an extra 256K for your 2000 for £325 plus fitting. It gave the 2000s out there a whole new lease of life. I remember deliberating about selling my 2000 for one of the other samplers announced at Winter NAMM 1986 (which included the Akai S900, the Roland S50 and the Korg DSS1) just because they had 512K of memory as standard, and then hearing with relief that the memory expansion would be possible with the Prophet. The 2002 had some ergonomic improvements over the 2000. The horrid membrane buttons were replaced by proper switches with LEDs in them so you could see which presets were selected from a distance. The gaudy different colours of the parameter tabs were replaced by a much nicer uniform blue, so you didn't get a headache looking at it. Best of all, it responded to aftertouch when played from a MIDI keyboard which generated it (although this facility was added to the software of the 2000 as well in a later update). In my case, I used a Prophet T8, which had never sounded quite as good as the Prophet 5, but which had the best keyboard ever for performance, with polyphonic aftertouch. I wasn't the only one to think so — New England Digital bought them from Sequential to put on the Synclavier. The story of the Prophet 2000 family doesn't end there. After releasing the Prophet 2002 rackmount (see the box above), Sequential continued development of the concept, and by the US Winter NAMM trade show of early 1987, they were showing the Studio 440 — a combination sampling drum machine/sequencer with built-in trigger pads which had learnt all the lessons from errors that Linn had made in their 9000 the year before (Linn paid the ultimate price by going bankrupt). The Studio 440 didn't have to wipe sequencer memory to make a new sample (like the 9000), its purchase didn't require a second mortgage, and, best of all for me, it loaded Prophet 2000 samples straight from floppy disk. The MIDI sequencing side was fairly standard, and would not raise too many eyebrows in this day and age — although Quantise was only ever performed on playback with the original performance being stored in memory, something common in today's sequencers. Nevertheless, the 440 gave you a realism to drum tracks which I don't think has been equalled since, not even by Roger Linn's excellent products for Akai. 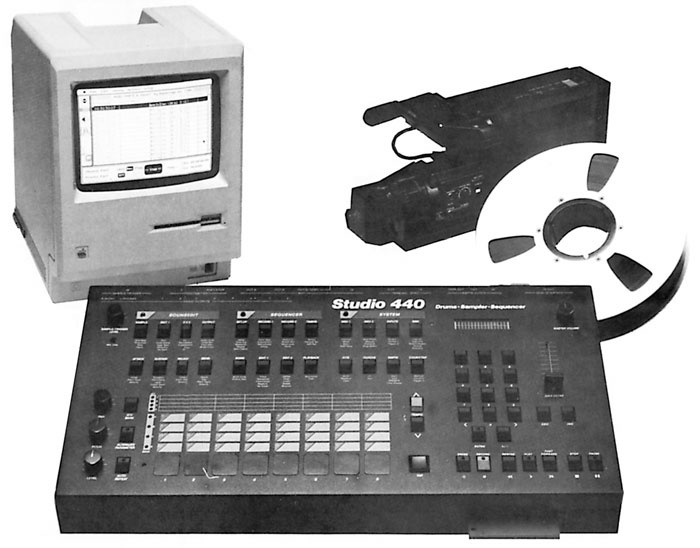 1987's Studio 440 multitimbral sampling drum machine/sequencer. That year, I had moved to California to pursue both my programming and journalistic careers, and the Studio 440 gave me one of the best introductions of my life. I was sharing an apartment with Andy Thomas who was running PPG USA from the place where we were living at the time. One day, a couple of guys came by for a PPG demo, and after they had had the full works from Andy, he got me to show them the 2002, which I had brought out from the UK with me. After they left, he told me they were Bob Bralove and Rob Arbittier who worked for Stevie Wonder. The Studio 440 featured on many sessions for Stevie Wonder's 1987 album Characters.A few days later, I got a phone call at 7 o'clock in the evening, asking if I would go over to Wonderland, Stevie's studio in LA. It turned out Stevie had bought the very first Studio 440 from Guitar Center that afternoon, they were having trouble working it, and it only came with three sample disks. As I drove out to the studio, I remember wishing I had paid more attention to the 440 demo at the Chicago NAMM show, but I consoled myself with the fact that I had three large boxes full of disks which would load into it. I emerged from the studio at 7am, as Stevie had ended up working all night writing a new song with the sounds I had. I should have been warned by that, as the next 18 months of my life would be messed up by his bizarre work schedule while we did the Characters album and world tour, but I wouldn't have missed out on the experience, and it was due entirely to the way I was able to jump in and work the Studio 440. The Studio 440 actually offered several improvements over the design of the 2000. The artificial division of the memory into two separate chunks was gone, so you could now use the whole 512K to make a single 12-second sample if you wanted to (this was, of course, an eternity in terms of typical 1986 sampling times). More usefully, there were now 32 sample locations. This meant that having loaded a 2000 disk with, say, piano or some other tuned instrument, you could then load individual drum samples and maybe bass, and a few solo instruments to get an entire piece going on it. The sustain and release loop format from the Prophet 2000 was also supported, so that work did not need to be done all over again, but the Sequential engineers could not resist an extra little trick, so now these loops could play forwards (like loops on all other samplers) or forwards/backwards, which meant that when the loop came to its end point, the data read out backwards until it got to the loop start, and then started reading forwards again. Of course, this didn't always sound good on every sound, but just occasionally, it let you loop a sound which was otherwise unloopable. I remember that in particular it worked very nicely for cymbals (which was handy on a sampling drum machine!). The auto-loop feature in forwards/backwards looping was even intelligent enough to look for zero-gradient points in the sample data instead of the zero crossings which made 'forwards-only' loops smooth. It was fantastic that the 440 loaded 2000 samples and their loop points, but there was one catch: the 440 didn't accept the preset mapping stored on the 2000 disks! Fortunately, mapping on the 440 had been made much simpler (they were expecting drummers to use the machine, after all...), so it took a fraction of the time to redo it, and the results were much more flexible. The 440's display was a much improved two-line LCD, so there was room to show the original-key, low-key and high-key settings for the sound assigned to each trigger pad. This meant that sounds could overlap, and there could even be gaps if you wanted, as the low key of the next sample was not automatically governed by the high note of the one before! Each sound could also be individually assigned to a MIDI channel, so now you could actually have several multisamples available concurrently, each placed on a different MIDI channel. This gave you the multitimbrality of the 2000, but with a greater useable range for each instrument. Of course, as the machine was a MIDI sequencer as well, it was not surprising that it had the ability to assign different sounds to different MIDI channels, and actually most people would have been using it in this way, rather than having it respond to external MIDI triggering. Indeed, the most common sight at the time was a Studio 440 as the brain in the centre of a system of other MIDI keyboards and modules. Remember, computer-based MIDI sequencing was not ubiquitous as it is these days, so the 440 provided an introduction to MIDI sequencing for many people. Personally, I never found it that useful for sequencing other things, the maximum resolution of 1/96th for unquantised notes being a little coarse for my taste, and so I stuck to a Roland MC500 for sequencing at the time — but I found the extra flexibility I got from triggering sounds in the same box very useful. Most of the rhythm tracks I programmed in this period were done on a 440 (drums percussion, bass line, and other rhythmic elements). Eight tracks certainly sufficed for this part of any song, although perhaps not for full orchestrations. Splendidly, though, each track could hold notes on multiple MIDI channels, so you could bounce completed parts together, free up sequencer tracks, and record further new parts. For me, though, the best things about the 440 were the features built in to help you get more feel into your rhythm tracks. Nowhere was this more apparent than in the Swing and Auto-Repeat modes. As someone born without the jazz gene (to quote a friend of mine), I found the swing parameter incredibly helpful in achieving feels which were difficult to express in conventional music notation. Previously, I didn't really understand the concept of robbing some time from the second quaver to extend the first, unless it was so much that the second quaver became the equivalent of a triplet and the first the equivalent of two (which is how I used to notate it). But the 440 let me experiment for the first time with subtle changes in the length of the two halves of the beat, and I could begin to get an idea of what people meant when they talked about swing. I still can't do it very well, but at least I know what others are doing when they play that way! Similarly the Auto-Repeat function gave a much better insight into how drummers use different strengths of stroke in fills and patterns to create a feel. Previously, I would have been too busy trying to get the individual strokes near enough the intended beat to worry about how hard each strike was. Now the Studio 440 took care of making sure repeated notes hit the beat dead on, and I could think for the first time about how hard or soft each strike should be. By pushing harder or softer on the touch-sensitive keypads whilst holding down the Auto-Repeat button (which would be set to repeat on quavers or semi-quavers, or even triplets), you could bring the force of each drum strike up or down, creating the most interesting nuances in hi-hat and tom-tom patterns. The 440 made me much more adventurous and subtle in my rhythm programming. Another splendid period shot, this one from the 1987 Studio 440 brochure served to illustrate the-then truly novel integration between the 440 MIDI sequencer/sampling module and the early Apple Macintosh using Digidesign's original Mac-based Sound Designer editor. Although the automatic zero-crossing selection made sample looping much easier, there were many other things on the Prophet 2000 which really cried out for visual editing software (not least the mapping). Fortunately, Digidesign had already developed their Mac-based Sound Designer software for the Emulator II and when they saw the 2000, they very quickly ported it across to work with the 2000/2002 via MIDI Sample Dump. Whilst this transfer protocol didn't work quite as quickly as the RS422-based protocol on the EII, it was a lot cheaper to support, as you could use any MIDI interface on the market. Suddenly, you could not only loop samples but map them to the keyboard visually (which was a lot easier for beginners to cope with than the 2000's own internal mapping). If you really wanted, you could run FFT displays just like Fairlight owners (although in black and white on the Mac Plus instead of green and white on the IIcx), and those into more useful features could actually draw out glitches in the waveform and perform digital EQ on samples. Today's developers of computer-based virtual samplers would do well to take a look at this 15-year-old software, as it offered several things which they don't do today. Of course, you had to live with those transfer times, but back then, Macs could only play back eight-bit 22kHz samples monophonically (they were called System Alerts in those days, not samples). Digital audio for the Mac itself was still a couple of years away. The 440 was also one of the first samplers to feature both SCSI, SMPTE and MTC compatibility. By 1986, many Macintosh owners were used to the concept of SCSI (I still didn't own a Mac myself, although I was just thinking of getting one to write my articles on and do sample transfers to and from the 2000), but it wasn't a feature of samplers by any means. The Emulator II was available with a built-in hard drive and a drive could even be retrofitted, but the connection was an internal interface which was not brought out onto the back panel. Now, suddenly, the back panel of the Studio 440 featured the same 25-pin connector we knew from the Mac and massive storage capacities were suddenly available (I think my first hard drive for the 440 was an unbelievable 40MB, which it seemed would never be full!). The number of drives compatible with the 440 was limited — I was aware of only the Dataframe 20 and 40 hardware from a company which has long since disappeared, merged with someone else or been rebranded. Despite this limitation, hard-drive compatibility was a major step in the right direction. SMPTE was another major addition. I had already been using a Roland SBX80 SMPTE box to sync my MC500 sequencer to tape, but that involved programming tempo information into a completely separate unit. The 440 showed me how much easier life could be if you could enter the appropriate number of frames per second directly into your sequencer and do any tempo mapping in that, rather than on a different unit. Striping tape directly from a sequencer was very liberating and the 440 could then control other sequencers and drum machines via the combination of MIDI Clock and Song Position Pointer (the standard means via which most devices communicated with the SBX80). But it also allowed synchronisation information to be shared with other devices via MIDI Time Code. Chris Meyer, who was with Sequential at the time, had been very instrumental in getting MIDI Time Code added to the MIDI spec, so that the exact time (and not just the relative tempo) could be sent between devices via the MIDI interface. The same timecode formats were available as via SMPTE, but now they could be communicated to devices which didn't have the necessary hardware to take SMPTE sync via an audio jack. 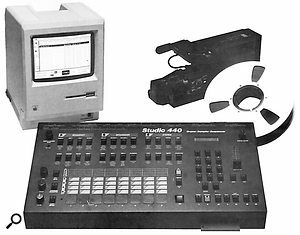 The Studio 440 also could sync to an incoming click track and learn the tempo map from this, so it could be sync'ed to a human drummer or an analogue sequencer, and this made it even more flexible. You could tap the tempo on the front panel as well, either to play a song back live or to simply set up what felt like the right tempo for a recording session. All in all, the Studio 440 did many different things in one box. It let you put more feel into drum parts, it let you have several multisamples available at once to play live or sequence, it let you control your other MIDI devices either by sequencing or clocking them, and it let you tie it all to tape, which was still very much the final recording medium at the time. No other one box had allowed you to do all this before, and so it saved those of us who realised its strengths both studio time and gear money. 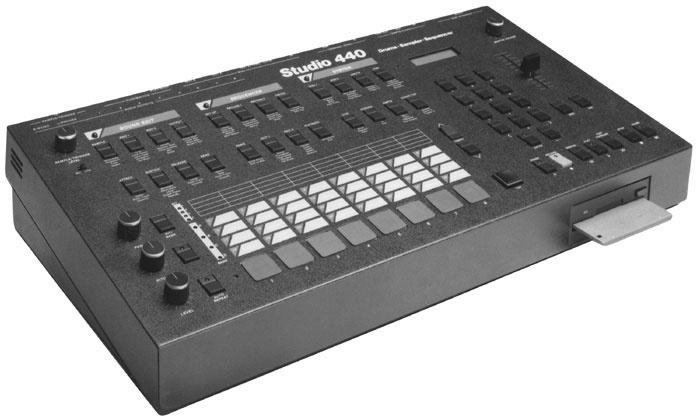 Of course there were those who got confused by this combination of roles, and thought it was just an expensive drum machine or a confusing sequencer, but those who 'got it' would argue the Studio 440's corner for hours. Plenty of artists became fans, including Willy M from London Beat, who wrote most of their hits on it (he owned about six of them at one point), and Lloyd Cole, who did an entire record with it. Years later, they were changing hands for more than the original purchase price of £3000. In the end, Sequential's samplers never quite conquered the world as many thought they would. Some people bought Roland's competing products because they had always bought Roland keyboards, and others bought the Korg DSS1 for the same reason. Emu came out with the Emax series at the same sort of price point, and a lot of people bought that because of the name, Emu having been there at the start of the whole sampling scene. But the majority of people went for the Akai S900 because it was easy to work, even though it didn't sound as good. I remember one particularly frustrating demo at Argent's in London where I clearly demonstrated the 2000's superior sound quality. Both customers agreed the 2000 sounded better, but still bought the S900 because of its big display. I tried to point out that the people listening to their music would not hear the fact that the machine had a nice display, but they were not to be swayed. Sequential must have lost many sales like that, and even the unique sound of the Prophet VS the following year, and the first inexpensive 16-bit sampler, the Prophet 3000, were not enough to save them from filing for bankruptcy within a couple of years. 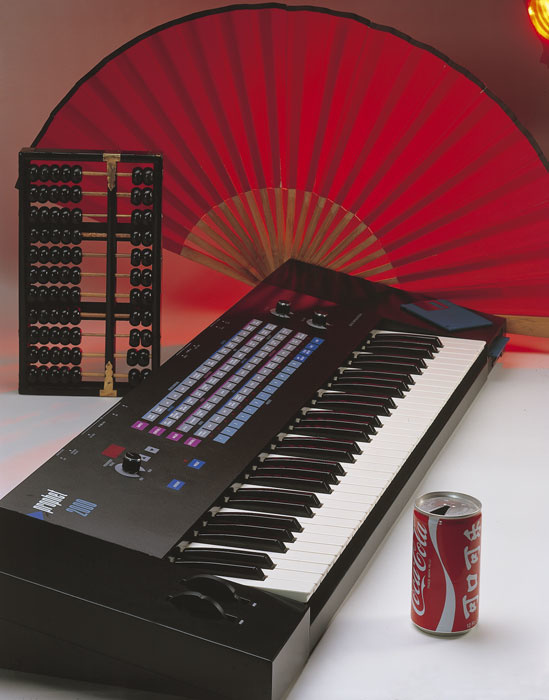 Yamaha stepped in and took over their design team in San Jose as an R&D facility (eventually passing it on to Korg while the two companies were affiliated at the turn of the '90s) and eventually put out the 3000 a year or so later. They sold through fine in 1989 — the whole story has been told in a previous Retrozone article (see SOS October 2000). However, by this time, the S1000 was on its way from Akai, and the rest, like Sequential's name now, is history.